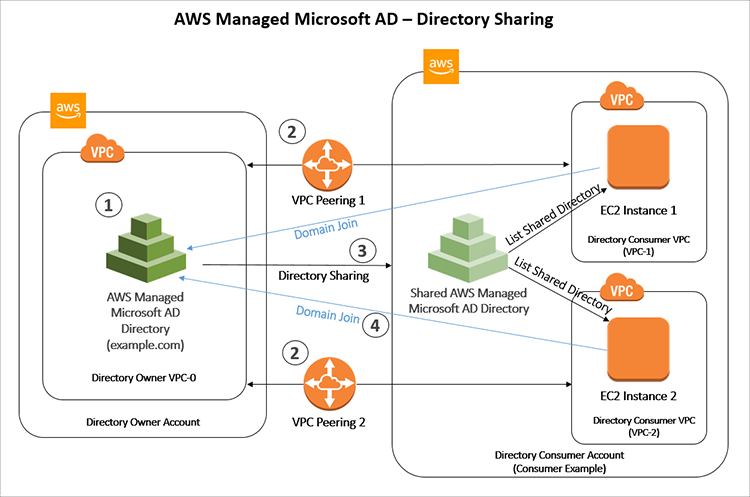 You can now share a single AWS Directory Service for Microsoft Active Directory (also known as an AWS Managed Microsoft AD) with multiple AWS accounts within an AWS Region. This capability makes it easier and more cost-effective for you to manage directory-aware workloads from a single directory across accounts and Amazon Virtual Private Clouds (Amazon VPC). Instead of needing to manually domain join your Amazon Elastic Compute Cloud instances (EC2 instances) or create one directory per account and VPC, you can use your directory from any AWS account and from any VPC within an AWS Region. Create an AWS Managed Microsoft AD directory. Establish networking connectivity between VPCs. Share the directory with the directory consumer account. Launch Amazon EC2 instances and seamlessly domain join to the directory. The following diagram shows the steps you’ll follow to use a single AWS Managed Microsoft AD in multiple accounts. 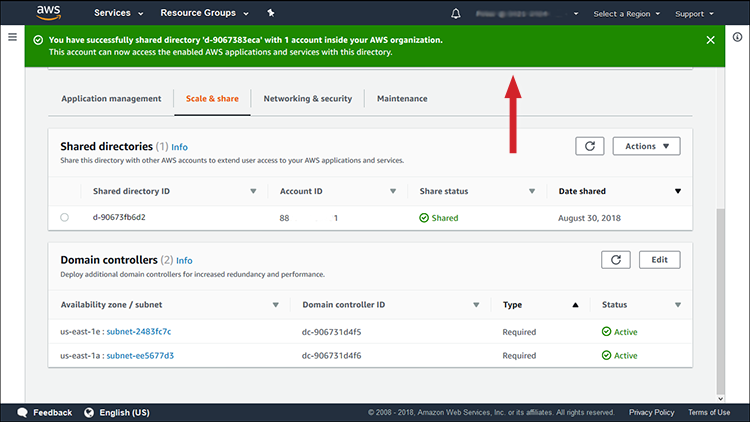 Note that when you complete Step 3, AWS Microsoft Managed AD will create a shared directory in the directory consumer account. The shared directory contains the metadata that enables the EC2 seamless domain join to locate the directory in the directory owner account. Note that there are additional charges for directory sharing. First, follow the steps to create an AWS Microsoft AD directory in your directory owner AWS Account and Amazon VPC. In the examples I use throughout this post, my domain name is example.com, but remember to replace this with your own domain name. When you create your directory, you’ll have the option in Step 3: Choose VPC and subnets to choose the subnets in which to deploy your domain controllers. AWS Microsoft AD ensures that you select subnets from different Availability Zones. In my example, I have no subnet preference, so I choose No Preference from the Subnets drop-down list. Select Next to review your configuration, and then select Create directory. It can take 20-45 minutes for the directory creation process to finish. While AWS Managed Microsoft AD creates the directory, you can move on to the next step. Next, configure your directory consumer VPCs’ security group to enable outbound traffic by adding the Active Directory protocols and ports to the outbound rules table. Now that your networking is in place, you must make your directory visible to the directory consumer account. You can accomplish this by sharing your directory with the directory consumer account. Directory sharing works at the account level, which also makes the directory visible to all VPCs within the directory consumer account. 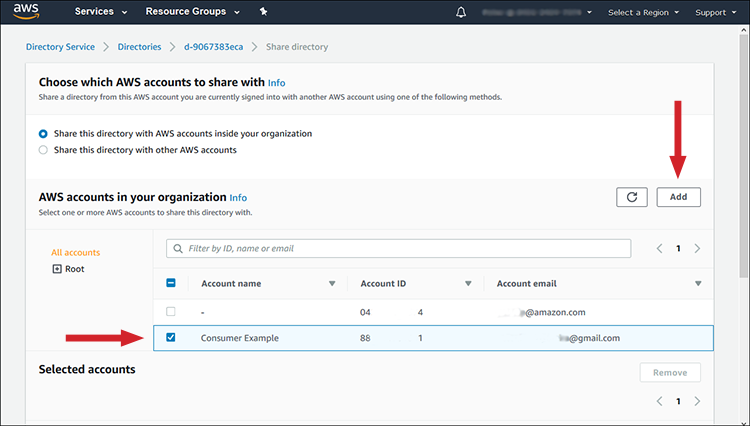 AWS Organizations makes it easier to share the directory within your organization because you can browse and validate the directory consumer accounts. To use this option, your organization must have all features enabled, and your directory must be in the organization master account. This method of sharing simplifies your setup because it doesn’t require the directory consumer accounts to accept your directory sharing request. Handshake enables directory sharing when you aren’t using AWS Organizations. The handshake method requires the directory consumer account to accept the directory sharing request. Open the AWS Management Console, then select Directory Service and select the directory you want to share (in my case, example.com). Select the Actions button, and then the Share directory option. Select Share this directory with AWS accounts inside your organization, then choose the Enable Access to AWS Organizations button. This allows your AWS account to list all accounts in your Organizations in the AWS Directory Service console. Select your directory consumer account (in my example, Consumer Example) from the Organization accounts browser, then select the Add button. To share your directory with multiple directory consumer accounts, you can repeat steps 3 and 4 for each account. Now that you’ve established the networking between your VPCs and shared the directory, you’re ready to launch EC2 instances in your directory consumer VPCs and seamlessly domain join to your directory. In my example, I use the Amazon EC2 console but you can also use AWS Systems Manager. Follow the prompts of the Amazon EC2 launch instance wizard to select a Windows server instance type. When you reach Step 3: Configure Instance Details, select the shared directory that locates your domain in the directory owner account. (I’ve chosen d-926726739b, which will locate the domain example.com.) Then select the EC2DomainJoin IAM role. Choose the Review and Launch button, and then the Launch button on the following screen. Now that you’ve joined your Amazon EC2 instance to the domain, you can log into your instance using a Remote Desktop Protocol (RDP) client with the credentials from your AD user account. You can then install and run AD-aware workloads such as Microsoft SharePoint on the instance, and the application will use your directory. To launch your second instance, just repeat Step 4: Launch Amazon EC2 instances and seamlessly domain join to the directory, selecting the VPC-2 instead of VPC-1. This makes it easier and quicker for you to deploy and manage EC2 instances using the credentials from a single AWS Managed Microsoft AD directory across multiple accounts and VPCs. 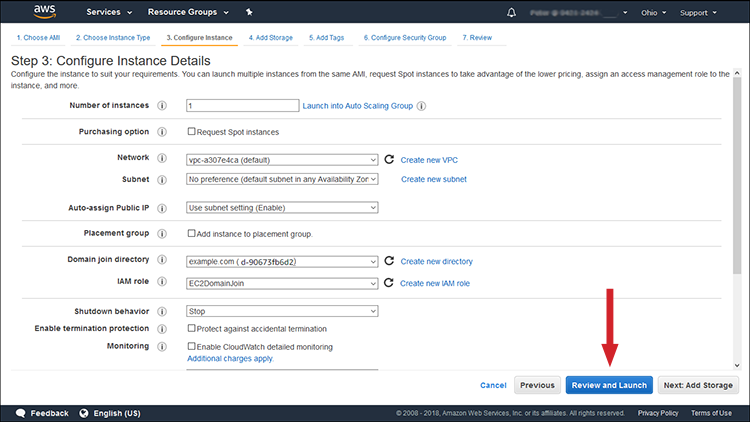 In this blog post, I demonstrate how to seamlessly domain join Amazon EC2 instances from multiple accounts and VPCs to a single AWS Managed Microsoft AD directory. 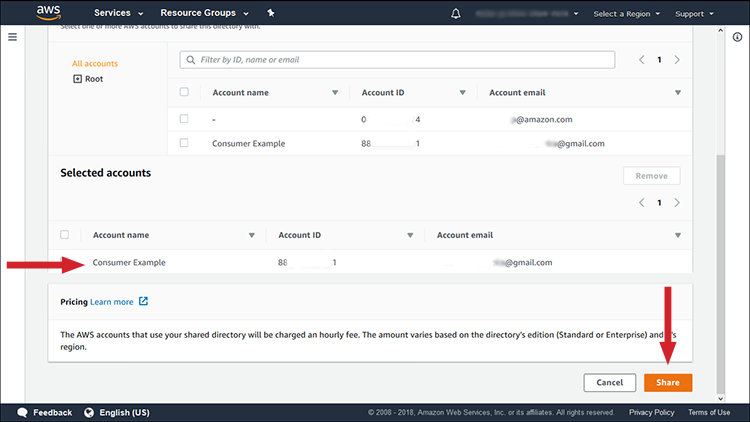 By sharing the directory with multiple accounts, you can simplify the management and deployment of directory-aware workloads on Amazon EC2 instances. This eliminates the need to manually domain join the instances or create one directory per account and VPC. In addition, with AWS Managed Microsoft AD and AWS Systems Manager, you can automate your Amazon EC2 deployments and seamlessly domain join to your single directory from any account and VPC without the need to write PowerShell code using AWS Command Line Interface or application programming interfaces. Peter is a Senior Technical Product Manager working on AWS Directory Service. He enjoys the customer obsession culture at Amazon because it relates with his previous experience of managing IT in multiple industries, including engineering, manufacturing, and education. Outside work he is the “Dad Master Grill” and loves to spend time with his family. He holds an MBA from BYU and an undergraduate degree from the University of State of Santa Catarina.